5. The total mechanical force exerted by a volume of air while expanding indefinitely is proportional to its G temperature. 6. A given quantity of air while expanding, under a constant pressure, from one temperature to another, exerts a mechanical force equivalent to one-third the difference of temperature; and the quantity of heat required to change the temperature of air under a constant pressure, is four-thirds of that required to effect the same change of temperature with a constant volume. The author concludes by observing that it is singular that these simple and, he considers, important deductions from MM. Gay-Lussac and Welter’s experiments, have been overlooked by the eminent mathematicians who have elaborately discussed this subject. The artificial position of the zero-point on the ordinary scales of temperature may perhaps account for this by its tendency to confine our ideas. 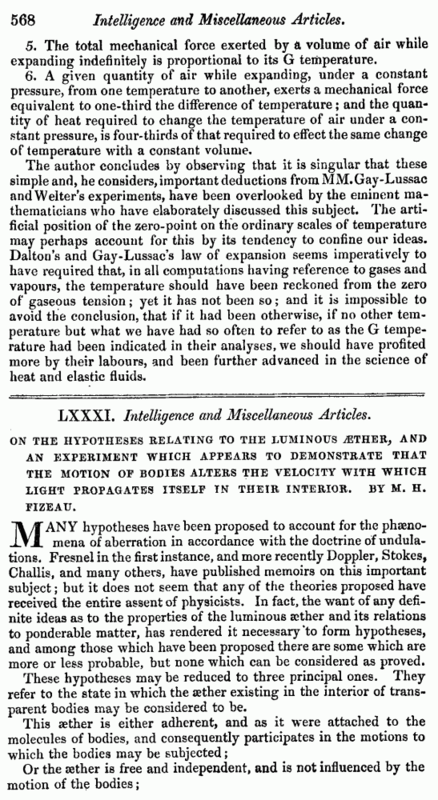 Dalton’s and Gay-Lussac’s law of expansion seems imperatively to have required that, in all computations having reference to gases and vapours, the temperature should have been reckoned from the zero of gaseous tension; yet it has not been so; and it is impossible to avoid the conclusion, that if it had been otherwise, if no other temperature but what we have had so often to refer to as the G temperature had been indicated in their analyses, we should have profited more by their labours, and been further advanced in the science of heat and elastic fluids. LXXXI. Intelligence and Miscellaneous Articles. 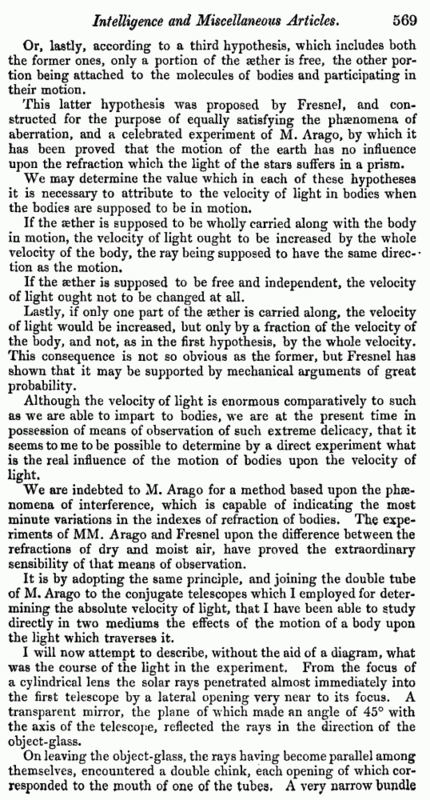 ON THE HYPOTHESES RELATING TO THE LUMINOUS AETHER, AND AN EXPERIMENT WHICH APPEARS TO DEMONSTRATE THAT THE MOTION OF BODIES ALTERS THE VELOCITY WITH WHICH LIGHT PROPAGATES ITSELF IN THEIR INTERIOR. BY M. H. FIZEAU. MANY hypotheses have been proposed to account for the phenomena of aberration in accordance with the doctrine of undulations. Fresnel in the first instance, and more recently Doppler, Stokes, Challis, and many others, have published memoirs on this important subject; but it does not seem that any of the theories proposed have received the entire assent of physicists. In fact, the want of any definite ideas as to the properties of the luminous aether and its relations to ponderable matter, has rendered it necessary to form hypotheses, and among those which have been proposed there are some which are more or less probable, but none which can be considered as proved. These hypotheses may be reduced to three principal ones. They refer to the state in which the aether existing in the interior of transparent bodies may be considered to be. Or, lastly, according to a third hypothesis, which includes both the former ones, only a portion of the aether is free, the other portion being attached to the molecules of bodies and participating in their motion. This latter hypothesis was proposed by Fresnel, and constructed for the purpose of equally satisfying the phenomena of aberration, and a celebrated experiment of M. Arago, by which it has been proved that the motion of the earth has no influence upon the refraction which the light of the stars suffers in a prism. If the aether is supposed to be wholly carried along with the body in motion, the velocity of light ought to be increased by the whole velocity of the body, the ray being supposed to have the same direc- • tion as the motion. If the sether is supposed to be free and independent, the velocity of light ought not to be changed at all. Lastly, if only one part of the sether is carried along, the velocity of light would be increased, but only by a fraction of the velocity of the body, and not, as in the first hypothesis, by the whole velocity. This consequence is not so obvious as the former, but Fresnel has shown that it may be supported by mechanical arguments of great probability. We are indebted to M. Arago for a method based upon the phse-nomena of interference, which is capable of indicating the most minute variations in the indexes of refraction of bodies. The experiments of MM. Arago and Fresnel upon the difference between the refractions of dry and moist air, have proved the extraordinary sensibility of that means of observation.